There is a duplex near me. Two apartments separated by a "party wall". Nondescript building set on a nondescript lot with indifferent landscaping done by an indifferent landlord. Run of the mill place for anywhere here in South Florida, you could drive past dozens of them and not really think twice about them. But this is Florida, The Land of Flowers "en espanol". Everywhere you look there are flowers. Wildlife is drawn to places where flowers bloom. Even the weeds here have their own flowers. It helps to break up a lawn from the insanity of growing turf grass in a place that gets 50 inches of rain a year, 40 of them in six months, 10 in the other six. It is the same place no matter what you call it. The native plants here have evolved to thrive under these conditions. The same flower that grows in the Wet Season disappears or at least slows growth when it cools down and the dry season takes hold. I had taken this picture because these flowers are beautiful to me. They're simple, they're common since they are pretty much everywhere, and they are native. I was told that they were Mimosa, but after two hours of research I was unable to prove what this specific flower was. The leaf under it looks like a mimosa but it didn't fold up when I touched it. 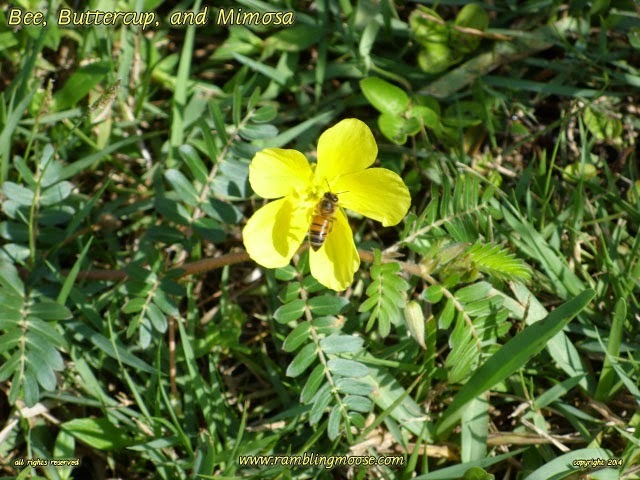 The closest I could find to the flower was a picture of something called a Cuban Buttercup but that is a bush and not a low slung plant. If I hold this flower under your chin it will show whether you like butter or not, if you're sitting in my friend Karen's yard back when I grew up. This flower is larger than Karen's buttercups, probably twice as broad across. they spread fast. Native species that will fill your yard if you let them. Pretty plant too, something I will definitely consider when I finally fill in my garden. Perhaps in the backyard under the hedges. Since I am an expert at growing stinkweed and other noxious plants, this would be a pleasant change of pace. I'm perfectly happy to chalk it all up to my own confusion and enjoy nature when it presents its sunny self to me. Knowing that they were there and in bloom, that morning I had grabbed the camera, walked over to the yard and took the pictures. They hunt the sun so to keep their blooms pointing at the light and warmth. That makes it trivial to get a bright yellow picture. While I was there, this bee visited. Bees are my kryptonite. I can handle snakes and frogs. I'm amused by lizards. I live in a house with a parrot and a dog, and none of them care about the lizards when they get in, but I can catch the little creatures and release them into my garden to go on their lizard-y way. Bees on the other hand send me running and screaming. I know that they have a very beneficial purpose but I just don't like them. Maybe if they ate mosquitoes and didn't sting I could handle them better. Having been stung twice in all my days I probably should handle it all better, but no. I can do without them in my presence. This one landed on the buttercup while I was taking pictures and I realized that the picture was much better with the creature on it than without it. Wildlife photography in the urban environment! Always take your camera! You never know what you may find! All that. Veni, Camera, Vici - I came, I took the picture, I conquered.